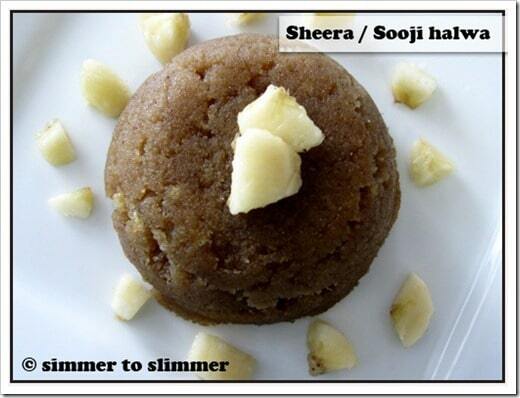 If I am in a mood for a quick dessert or a good heavy breakfast, Sheera or Sooji halwa is my food of choice. Sheera is often served as breakfast, dessert and very often as an offering to god. 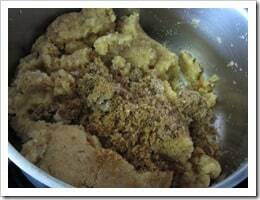 You can pair with poori to make a mouthwatering dish – poori halwa. 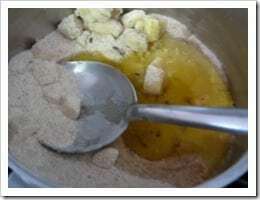 Though it is relatively easy to make, it took me a while to get it right..I couldn’t get the texture right.. the sooji would be too raw or soggy…Sheera can be made with 4 basic ingredients – sooji/semolina, sugar, water, and ghee. The other optional ingredients that are can be added are ground cardamom, a pinch of saffron, cashews, and raisins roasted in ghee. I went a little further and added banana..not that it is uncommon to add a banana or even pineapple for that matter. Once you get the basics down you can always play around with the ingredients. 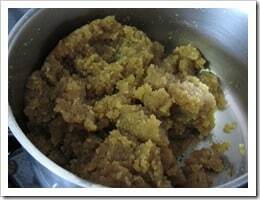 I used part brown cane sugar so that the Sheera gets a nice brown color but you can certainly use sugar instead. Serving size: 1/4 of a recipe (4.8 ounces). 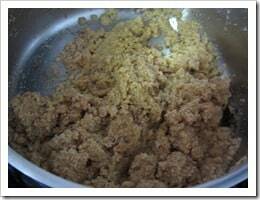 If you are planning to include nuts, quickly roast them in ghee for 30 seconds and then add sooji to it. If not, skip to step 2. 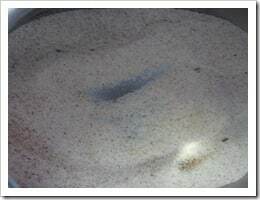 Dry roast sooji on medium heat in a medium sized wok till a strong aroma emanates from it. It will roughly take around 8 – 10 minutes. [ Make sure you are constantly stirring it]. Simultaneously keep water to boil in a small cup. 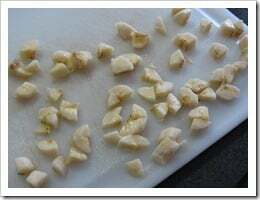 Add ghee and banana (if using) and continue roasting for another 2 minutes. Add cardamom (if using) and mix well. 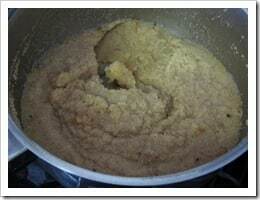 I’ve never tried preparing sheera with bananas and brown sugar. Will try this recipe for Sunday breakfast :).